Indometacin 50mg comes in capsule form. It belongs to a group of medicines called NSAIDs - Non-Steroidal Anti-Inflammatory Drugs. It is used to relieve the pain and swelling of joints, muscle bone, ligament or tendon disorders, stiffness and swelling of the backbone and pain and swelling after bone or joint surgery. Indometacin 50mg capsules should be kept out of sight and reach of children. It should be stored in its original packaging and should not be stored over 25 degrees Celsius. 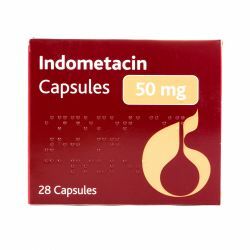 When using Indometacin 50mg, you should follow the instructions given to you by the doctors. The usual dose given for arthritis treatment is one capsule to be taken up to three times a day. The capsules should be swallowed whole - not chewed - and with a drink of water, during or after meals. If you take more capsules than recommended by your doctor, you should speak to your doctor, pharmacist or hospital as soon as possible, taking your medicine with you. If you forget to take a dose, do not double up doses. Take the dose as soon as you remember if necessary and then take the next dose at the correct time. The active ingredient in these tablets is Indometacin. The other ingredients are lactose, sodium laurilsufate, magnesium stearate, anhydrous colloidal silica, gelatin, yellow iron oxide (E172), titanium dioxide (E171), black iron oxide (E172), shellac, quinolone yellow (E104) and erythrosine (E127). Indometacin 50mg capsules should not be taken if you are allergic to any of the ingredients in the medicine or other NSAIDs such as aspirin. They should not be taken if you have had asthma attachs or a skin rash, swelling of the face or throat or a blocked or runny nose, if you suffer with nasal polyps causing a blocked nose, headaches or a reduced sense of smell and taste, if you have or have had serious problems with your heart, liver or kidneys, if you have or have had repeated ulcers or bleeding in the stomach or intestines or if you are in the last three months of pregnancy. You should speak to your doctor before taking Indometacin 50mg capsules if you have heart problems, have had a stroke or think you might be at risk of these problems, if you have or have had any problems with your kidneys or liver, have asthma, mental health problems, epilepsy or Parkinson's disease, have blood cloting problems, have an infection or are being treated for an infection, have a connective tissue disorder or if you are elderly. Indometacin may be associated with a small increased risk of heart attack or stroke. Any risk is more likely with higher doses and prolonged treatment. Do not exceed the recommended dose or duration of treatment. As with all medicines,Indometacin 50mg can cause side effects, although not everybody gets them. You should stop using Indometacin immediately if you notice any signs of an allergic reaction. You can minimise the risks of getting side effects by taking the least amount of tablets for the shortest amount of time necessary to control your symptoms. 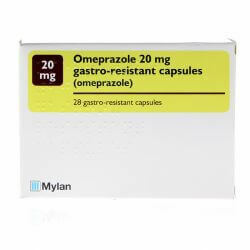 You must stop taking this medicine and seek immediate medical help if you pass blood in your stools, pass black tarry stools or vomit blood or dark particles, if you have indigestion, heartburn or aches and pains in the stomach area. Allergic reactions may cause asthma, difficulty breathing or fluid in the lungs, itching, rashes, blistering or skin peeling, swelling of the eyelids, lips, throat, hands, feet or ankles and sensitivity to light. 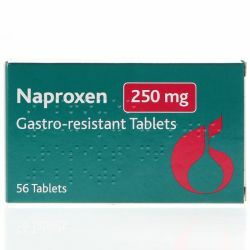 Other side effects include headaches, dizziness, vomiting or nausea, aches and pains in the stomach area, constipation or diarrhoea, gas, indigestion, heartburn, ulcers or bleeding in the stomach or intestines, fluid retention, high blood pressure, chest pain or a fast or irregular heart beat, heart failure or a small increased risk of heart attack or stroke, kidney disease which may cause swelling of the face and ankles or blood in your urine, liver disease which may cause yellowing of the skin and whites of the eyes. Side effects also include reduction in red blood cells, bleeding, bruising or sore throats, aseptic meningitis which causes stiff necks, headaches, vomiting, nausea or fever, depression, axnxiety, disorientation, hallucinations, confusion, nervousness, vertigo, difficulty breathing, concentrating or sleeping, rining in the ears, blurred vision, sudden loss in vision or pain on movement of the eye, mouth ulcers, involuntary movements, loss of co-ordination, muscle weakness, numbness or tingling, an inflamed pancreas which can cause severe pain in the stomach area and back.